Kathrin Aste gained her Diploma in Architecture from the University of Innsbruck, then, in 2004, established Aste Architecture. In 2009 she founded LAAC Architects with Frank Ludin. LAAC is focused on contemporary architecture for urban and landscape contexts, particularly alpine infrastructures. The sites for their projects have ranged from Innsbruck’s medieval town centre to the mountains of Kazakhstan. In high altitude and inaccessible sites, the practice has developed great material precision; for instance, the daring Mountain Peak Platform ‘Top of Tyrol’ (2009) was constructed in parts and transported by helicopter – 20 flights over three days. Edith Schlocker described the project in Austria-Architects as ‘architecture as a tight-rope artist’. Their material experiments engage structural technologies, extreme climates and history. 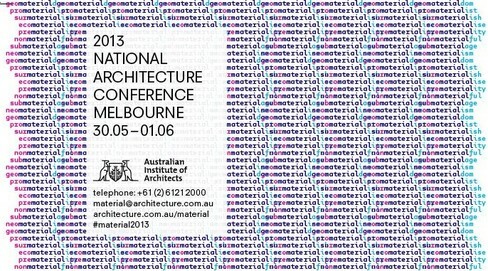 A rich array of international and Australian speakers has been confirmed for the Australian Institute of Architects’ 2013 National Conference – MATERIAL. Creative Directors Sandra Kaji-O’Grady and John de Manincor have selected 14 presenters including academics, artists, practicing architects, historians, researchers and problem solvers, once again securely positioning the 2013 conference as a must attend annual industry event. ‘The quality and diversity of the approaches to MATERIAL that speakers will present at this year’s conference highlights the complex nature of how architects, both locally and internationally, explore this multifaceted topic. ‘The variety of MATERIAL(s) used by the speakers at the conference is both astounding and exciting: including coloured light, heat and gaseous composition (Philippe Rahm), latex, pollution and time (Jorge Otero-Pailos), printed ceramics, straw and cardboard (Virginia San Fratello), cellophane and LED’s (Billie Faircloth), brick-laying helicopters (Matthias Kohler) and more,’ say the Creative Directors.